Your quest for high quality Cobalt Carbonate ends at Vijaya Enterprises. We are Cobalt Carbonate Chemical Exporter & Supplier. 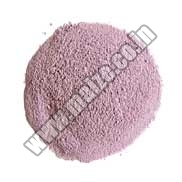 We bring to you a Chemical Cobalt Carbonate that is broadly used in animal fodder as an additive. Available in unlike quantities and packs, our Cobalt Carbonate is also utilized as poultry, animal and cattle feed. We are named as the most outstanding Cobalt Carbonate Exporters from India. The Chemical Cobalt Carbonate provided by us is of unparallel quality and can be procured at highly competitive prices. We take different capacity orders for Cobalt Carbonate from customers. We never delay the order! Customers can also rest assured that only the highest quality would reach them. We have a vast distribution system and our customer base is also very large. We feel complacent that we receive no complaints from our customers. We can also easily handle the urgent requirements of customers for Cobalt Carbonate. Cobalt Carbonate has been used from past as algaecide in aquaculture operations and farm ponds. We pack Cobalt Carbonate well before dispatching and also test the quality of the product thoroughly in our testing units. We ensure that no deterioration in quality occurs while the product is being transported.